Yesterday I was in Dean Swift’s Book shop in Nowra looking for a Bernard Cornwell book for Bill – he loves how Cornwell takes historic 17th and 18th century facts and turns them into incredibly detailed and vivid modernised stories. Bill’s always encouraged me to read. He says ‘it’s very good for your imagination’. I’m not sure I need any encouragement to promote my imagination since it runs rife without my volition on an all too regular basis. I once started to read one of Cornwell’s books. It was all roses for the most of the first chapter and I thought I might actually be able to get into this kind of historic tale. It was a tale of ‘Alfred the Great and his descendants as told through the eyes of Uhtred, an English boy born into the aristocracy of ninth-century Northumbria, captured by the Danes and taught the Viking ways^. As I read on, I realised I’d gotten towards the end of the first chapter – unheard of for me in one sitting. I became enthusiastic, enjoying getting engrossed in the beginnings of a story that could possibly hold my interest. I came to the very last page and suddenly I was thrusted into shock when the last paragraph detailed a brutal and disturbing beheading. Just the treat before I was to venture off to tranquil, peaceful slumber! It’s fair to say I didn’t read another of “Bill’s types of books” but I found that I had developed a knack of finding him better books than he was able to find for himself. And the Bernard Cornwell, rip your head off type were exactly what my man needed more of. I’m not so sure but who am I to know what a man’s soul needs. If nothing else, the least I can grant him is what he says he needs, wants and enjoys. So, the new, thirty two dollar Cornwell book was in my hands. I gently flipped it’s fresh smooth pages as I browsed more books. I have a bit of a book fetish – not the worst of fetishes I think. None the less, every time I rearrange my books in my home studio, I always seem to manage a cry of “what the hell am I doing with all these books” and yet I still love them. Perhaps it is associated with a drill my sister use to have where she would take me to a newsagent or book shop and encourage me to snif the pages of the glossy, almost perfumed pages of not one but several magazines. I don’t know, but books do something to me and I’ve often thought that in another life I could be a book-shop owner. Perhaps I’ll reincarnate as a stork carrying an expensive or rare illuminated text? I continued to browse and spotted a lovely hard covered book at the end of a book shelf right up the back of the book shop. The art on it’s cover grabbed my attention immediately. It’s that kind of image that spoke to me – almost like something I have created or would like to create. I flicked through the pages and reviewed the artists’ life and works. 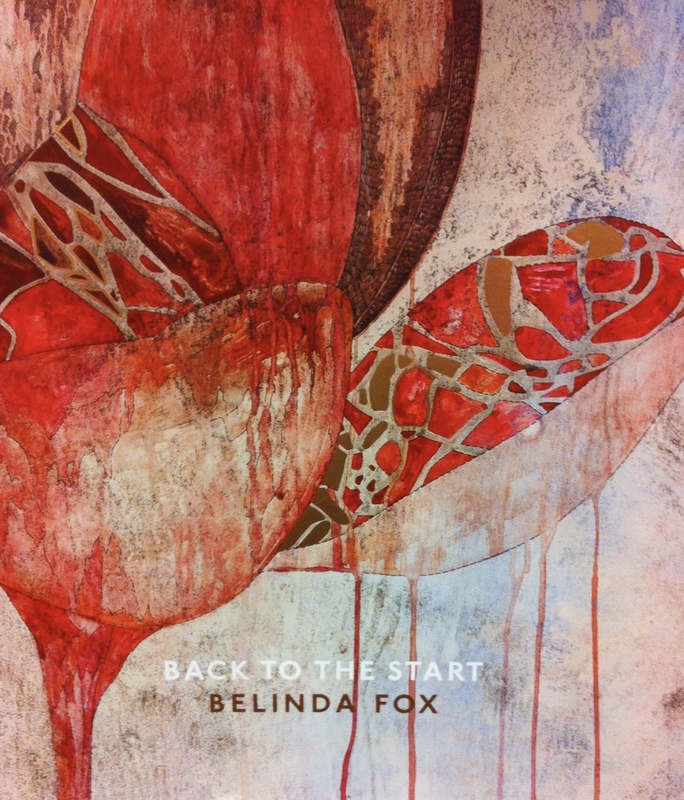 Seeing the photos of Belinda Cox, her studio set up, the mood boards displayed around her studio for inspiration and focus and all of her consistent and recognisable artwork, reminded me of how little I was as an artist and how some people develop into adult, professional and sophisticated artists. Despite feeling a little artistically and creatively crushed, I just had to have the book. It had a firm, smooth-feeling cover, it was wonderfully colourful throughout and it felt well made. The art on it’s cover and within it really resonated with me. Then I looked at the price of the book ($85) and realised perhaps I could simply view her art on the web or buy the book cheaper online (I looked it up while I was in Dean’s – $53). It wasn’t until I got home and really looked at the art with a more considered and discerning eye that I realised it didn’t resonate with me as deeply as when I was in the shop. When I got home and viewed her art online it appeared murky – not as clean, colourful and vibrant as I had first thought. None-the-less it was incredibly modern, intuitive and mature art. I could certainly learn from this woman. I read her profile and once again felt small. So what has all this got to do with the truth about creativity? All the books, videos, speeches, profiles, the three, five or twenty-step processes and therapy I’ve completed over the years .. I know they are well-meaning, but what they have failed to ‘cure’ for me is the annoying reoccurring unconscious patterns that have come from years of indoctrinations which have suppressed my creative genes and rung in my ear like an incurable case of tinnitus. Perhaps one of the only things to help me consider how my belief systems, innocent views and natural talent could have been tainted, suppressed or essentially ‘murdered’ during my younger impressionable years is Julia Cameron’s The Artist’s Way. I went through that book with a fine coloured pencil inch by inch, completing every activity, every contemplation and every exercise. And aside from a little creativity in completing the exercises, there was virtually no increase in creativity that came with it for me. I’ve read, I’ve watched, I’ve listened and I’ve meditated on how to be more creative and I’ve desperately searched for something that will bring my ‘creative gene’ back. I’ve been advised to go out, to “fill the well”, to get inspired by the likes of Julia Cameron’s book, Belinda Cox’s art or even Bernard Cornwell’s beheadings! I’ve self educated and done a myriad of things that were designed to inspire me and to promote creativity but at the end of the day none of it has worked – for me at least. Now that I’m an adult with natural urges and surges of creativity that were disrupted and who’s confidence and ‘artistic maturity’ never really developed or florished, I’m stuck. What could have been a normal creativity flow is never going to be like second nature as it might have been when I was an aloof and creative child or adolescent. The truth for me is one of either two things – drop the fantasy of being the impulsively creative child I use to be – without critiuque without reason and without comparison – or perhaps I’ve got it all wrong and that banging my head against the creative barge poll will never reveal the pool of creative oil that I’ve been misguided in believing would happen if I banged hard enough. Perhaps in letting all of this go, it be what it will be. ^ Bernard Cornwell, The Last Kingdom Series, http://www.bernardcornwell.net/series/the-last-kingdom-series/, sourced 16 December 2016. < Downloading new software to take the focus off my head!